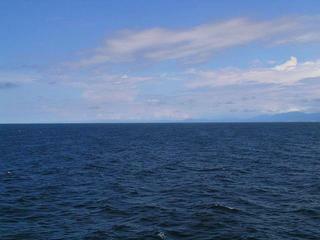 07-Jun-2006 -- The visibility in the southwestern corner of the Caribbean Sea is indeed very good, and so today I could visit my first Colombian confluence, 12N 74W. The territory of Colombia was visited in 1502 by Columbus. In 1536 a Spanish expedition penetrated into the interior and established a government until the revolt of Spanish-American colonies in 1811 to 1824. In 1819, Simón Bolívar established the Republic of Colombia (Gran Colombia), consisting of the territories now known as Colombia, Panama, Venezuela and Ecuador. In 1819 to 1820 Venezuela and Ecuador withdrew and in 1831 the remaining territory transformed into the Republic of New Granada. In 1858, the name was changed to the Granadine Confederation and in 1861, to the United States of Colombia. Panama seceded from Colombia in 1903. Three great ranges of the Andes transverse Colombia from N to S and are known as Cordilleras Oriental, Central, and Occidental. The highest peaks rising to more than 5,000 m, are in Cordillera Central, on which stands the capital Bogotá at an elevation of 2,700 m.
Washing of the ship goes on. As clinker residues are very stubborn, we are attacking now with hydrochloric acid. For the full washing about 2,000 litres (530 US gallons) are required. On our arrival at Puerto José (Venezuela) everything will be ready. The coast can be very well seen from the Confluence. It is quite irregular being indented by several coves, known collectively as Los Ancones. They are separated by headlands, which rise to high bold rugged hills. Attached are the views to SSE, South and SSW. The best view is towards South, to Cabo San Juan de Guía and Cabo de la Aguja. Close by is Santa Marta, a commercial port and the capital of the department of Magdalena. Simón Bolívar, the liberator of South America, died here in 1830. Two days later we arrived at the "Petro Zuata Seco" Terminal of Puerto José, a really idyllic place... Coke is loaded by a loading pipe fed by a conveyor belt and poured into the cargo holds. Here the first tons of altogether 31,700 tons of coal do arrive. And this picture shows how it looks like when a cargo hold is full. This is cargo hold nr. 5 and contains about 6,000 tons. As it is good practice, also here in Venezuela we have hoisted the national flag as a sign of courtesy and that we honour the nation.